Seize the competitive advantage on the battlefield! Instantly reload darts in to any BOOMCo. clip! Carry multiple blasters, up to 40 Smart Stick darts, and 4 Smart Stick Rounds. Removable dart holder can be attached to a belt loop or backpack for easy ammo access. The BOOMco. Rapid Reload System gives you an awesome advantage on the battlefield. 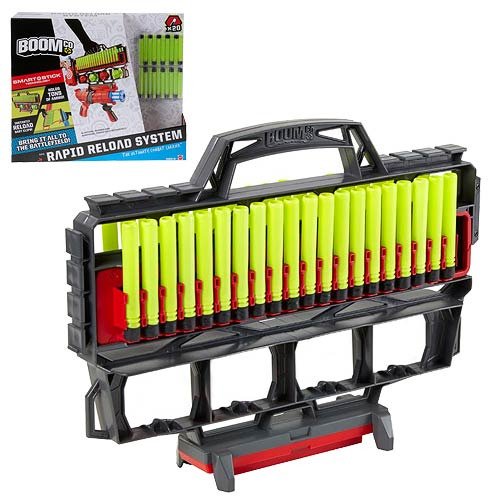 Able to carry multiple blasters and tons of extra darts and rounds into action, you will command the competitive edge and keep the play going and going! The Rapid Reload System comes with 20 Smart Stick darts and can hold up to 40 darts and 4 Smart Stick Rounds. The removable dart holder has a clip that can be attached to a belt loop or backpack for easy access. It's compatible with the BOOMCo. clip system, so you can instantly reload darts in to any BOOMCo. clips! Blasters, rounds, and accessories sold separately. Ages 6 and up. BOOMco. products feature Mattel's Smart Stick technology, an awesome material that's on the tip of every dart and in every round. It sticks to BOOMco. targets and blaster shields, so you see exactly where you nailed it!